A brighter picture seems to be on the cards for the European film industry after a fruitful dialogue between the European Commission and film professionals in Cannes. Two weekends ago in Cannes, a Europe-centred political event finally gave a brighter picture for the near future of the film industry within the digital market. It started with both the European Commission and film professionals showing their openness to dialogue and their willingness to set up rational rules. It ended on the Monday afternoon, with the launch of a new working group involving four film professional organisations that represent almost the entire creative chain. The European film industry has never appeared so united. In a statement published in Le Monde on 15 May, Commissioner Günther Oettinger, in charge of the Digital Single Market strategy, continued to blow hot and cold with regard to the future of the film industry. On one hand, he reaffirmed the fact that the digital strategy would preserve the film financing system and territoriality, while on the other, he confirmed the Commission’s desire to open cross-border access via a reform of the copyright. “European rules on copyright must be adapted to digital technologies," he said. On 17 May, the industry was ready and waiting for the Commissioner in Cannes, prepared to repeat its concerns, to say the least. But in the end, peace prevailed. Incredibly, the speeches given were all on the same page. 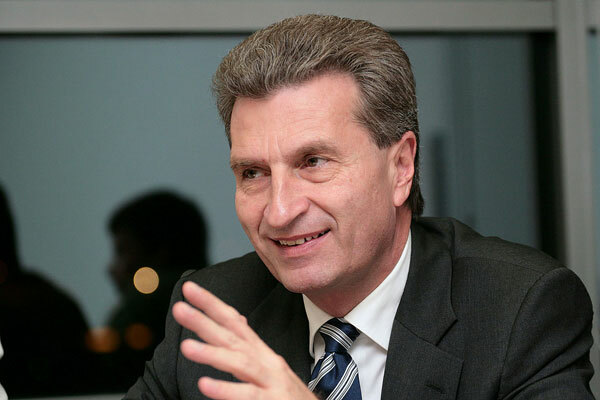 “We don’t want to damage our creative industries or the film sector,” said Oettinger. At one point, the Commissioner even mentioned the possibility of the film, broadcasting and sport sectors being exempted from the DSM plan. The number-one priority, it was announced, is now the fight against piracy, a point on which everyone agrees. Yet, “It’s always dangerous when everyone seems to agree,” teased French Prime Minister Manuel Valls in the speech he gave on Sunday at the press conference on copyright organised by the Ministry for Culture and Communication. In fact, as time is running out – with the DSM plan to be set in stone at the end of 2015 – the industry remains cautious. Taking part in the panel organised by the Ministry, Marco Chimenz, president of the European Producers Club, announced the creation of a focus group to help the Commission set up coherent rules to improve the accessibility, distribution and circulation of films in Europe. The European Producers Club, Europa International, Europa Distribution and EuroVoD are the four bodies involved in the initiative. “We, the presidents of the four networks, make the commitment to build an integrated and cross-sector reflection on film circulation. We will gather our ideas to propose an alternative plan of action able to reach audiences and improve the distribution of our works in Europe,” says the joint statement, published on Tuesday last week. The working group will be composed of producers, distributors, sales agents, broadcasters and VoD platforms. As the Cannes Film Festival came to a close, pragmatism seemed to be the order of the day. The four associations will assemble several times this summer and hope to present an alternative plan of action to the Commission in September. The initiative will be backed by EFADs and the authors’ associations FERA & SAA. This is the first time that such an integrated brainstorming initiative has been set up by professionals. Let’s hope that the union sacrée will stay on its toes as the Cannes glimmer fades away.